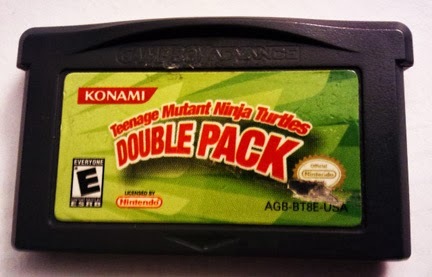 Since the most recent wave of TMNT mania, I've been constantly digging out plenty of my old nostalgia fueled memorabilia, and in this post it's about the GBA TMNT 1 and 2 (Battle Nexus) 2 pack video game. I figured while I'm on what appears to be a never-ending wait for TMNT: Out of the Shadows to be released on PS3, I might as well re-play some of the older Turtles games. This Game Boy Advance 2 Pack follows the story of the 2nd Ninja Turtles television series in 2003. After doing a bit of searching, it had been 10 years since the last real TMNT game released, which was TMNT: Tournament Fighters on the NES, SNES, and Sega Genesis. Note, I am not counting TMNT: Dimension X Assault or Ninja Turtles: The Next Mutation LCD handheld games in this, as they are barely games at all, even if my inner 8 year old says otherwise. In this game they took an ingenious route- each turtle gets their own set of 5 levels. Based on various episodes from the show, one tale for each Turtle. Granted, I'm taking into consideration that this is a simple, single player side-scrolling platformer, with a touch of beat-'em-up, lacking the best part of all previous TMNT games- CO-OP teaming up! 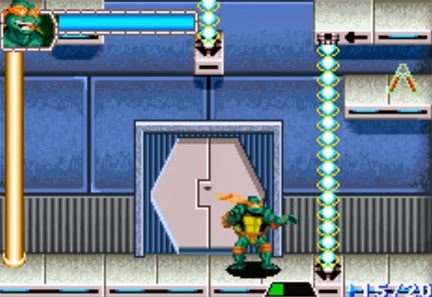 In fact, of the 5 unique levels for each, one level per turtle is a "vehicle" level, such as Michelangelo getting to skateboard through the sewers and Donatello hang gliding. In addition there is one extra bonus level if you manage to collect all the hidden crystals in all the other levels. There are 4 distinct sets of moves, allowing each turtle to be a bit different instead of being just a palette-swap. They all have a special ability as well, Donatello can leap gaps, Raphael can climb walls, etc. So while all four Turtles feel different, they sadly, somehow still feel the same. And despite having charge attacks and a health-eating special attack, it's much faster, easier, and more effective to mash the attack button for small combos. Unfortunately this is due to the fact that enemies, including bosses, are mostly push overs. Normally I don't complain about this as a problem, but I really think it would've been beneficial to either make more enemies to fight or make them slightly smarter. It isn't very fun when you just walk up to a goon and they just look at you menacingly while you wail on them. I don't even think I used any of the Turtles' charge attacks at all, just the button mash combos to get through the entire game. The backgrounds are adequate, with very few little touches to make anything noteworthy. As for the sounds? They are ok at best, nothing special at all. Decent music and a couple phrases and grunts here and there. Really, the game's biggest loss is in play time. The game took me maybe an hour to beat. And to be fair, a decent amount of that hour was skimming through the lengthy cut scenes. A small amount of fun that ends much too soon. 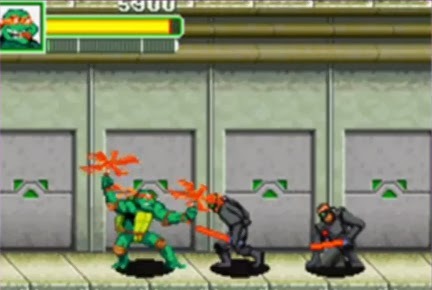 Seriously, the best part of the game was in Raph's stages- you get to fight fan-favorite Casey Jones as a boss, and then in a later level, fight side by side with him. It always amazes me when a company somehow manages to take a fair start, the TMNT 1 for GBA, and make a far inferior game for a sequel. Of course, if you read the above review, you know that it wasn't the best game, but it wasn't awful either. I'm not joking here, Battle Nexus is a significant step backwards from the first game. While the game looks and sounds much better, the introduction of stealth is awful. Why the creators chose to implement stealth in Battle Nexus is quite the baffling thought. One would guess there would be a lot more, you know, battling. At the beginning of EVERY level, you have to sneak past all the guards and cameras to find your lost weapon(s). Which wouldn't be too bad of an idea, but for some reason the NINJA Turtles can't use any ninjitsu- they get throwing stars that do a laughable amount of damage to enemies. Tickling them would be much more effective. The "stealth" here is terrible. If you are spotted, you can just hop into an alcove, even with enemies watching you, and shortly they'll forget about you and go back to their sentry circuits like nothing happened. It is a frustratingly useless mechanic in a game that has Battle in the title. Once you finally obtain the weapon for your chosen Turtle, you generally have to backtrack to collect crystals to unlock later worlds. And speaking of backtracking, most levels must be played through with multiple Turtles to collect all the crystals, as each of their individual skills leaves some to be unobtainable by the other 3. Forced repetition is not appreciated in this instance. Every time you replay a level to collect a few more crystals you have to begin anew, sans weapon and forced to sneak by enemies again. Battle Nexus should've probably been called Boring Tedium. Yes, I used those synonyms together here for a very good reason. It needs to be stressed how annoying the repetition is. Because it becomes a slog during the first world's missions, leaving one with a difficult choice- to finish or move on to better games? Outside of the general disappointment of not having beat-'em-up action, this game does offer a bit more. There are also Race and Battle Modes. The Race Mode is simply a bunch of hover-boarding levels from the main story quests in their own section, while the inappropriately named Battle Mode isn't actually about battling at all. Instead you have to collect a bunch of crystals in a set amount of time. Lastly- apparently, there was a tie in to the console version that gave codes to open a slew of hidden levels in the GBA. Not much, but a nice addition if you are willing to tough it out and put in the extra game time for any version of Battle Nexus. Honestly, as a lifelong TMNT die-hard, this was a maximum of 3 hours of total play, and not really great play at that. The short gameplay and long cutscenes really hampered the potential of this these 2 games. The hour or so it took to beat the first game was an enjoyable sitting, but Battle Nexus was a large step back and not worth the time to play. That being said, it really feels like they skipped over all the great arcade beat-'em-ups previously made and went all the way back the the original NES Turtles game for inspiration- a grave mistake in this case. I would only recommend this to fans or younger children, as there are many other TMNT games that are worth the time to play. They always have a plethora of TMNT goodness to peruse.